What is the Cat 4 Containment Line ? The Advisory Committee on Dangerous Pathogens (ACDP) categorises pathogens according to how hazardous they are. Category 1 is relatively harmless and Cat 4 is the most hazardous viruses including Ebola Zaire and Lassa fever. Any work on Cat 4 material must be done in a Containment level 4 laboratory inside a Class 3 microbiological safety cabinet. If the nature of the work is such that it may require examination in several Class 3 cabinets carrying out different tasks, the cabinets can be linked together by a central spine. This is known as a Cat 4 containment line. Personnel at QAT designed the World's largest cabinet line of this type, located in the UK. 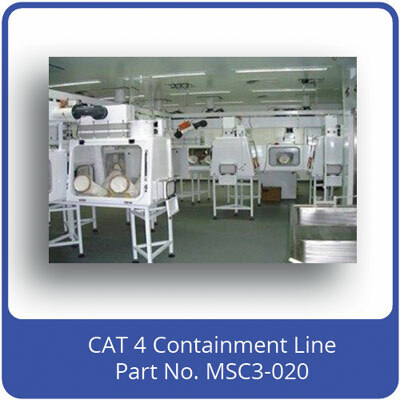 The Cat 4 cabinet line is designed for the safe analysis of very hazardous biological material. The material may be naturally occurring or genetically modified for use as a biological weapon. Operations that can be carried out in the specially designed class 3 cabinets are: ultra-centrifuging, freezing, microscopy, incubating etc. Class 3 cabinets usually have their own dedicated exhaust fan. In order to integrate all the class 3 cabinets and spine to the laboratory's air extract system, an air manifold running the length of the spine was used. The manifold is extracted by 8 exhaust fans to the laboratory's air extract points via thimble systems. The manifold is connected to each class 3 cabinet and at 5 points along the length of the spine. All air is HEPA filtered in and dual-in-line (DIL) HEPA filtered out. The manifold is automatically controlled at a low negative pressure so that any number of class 3 cabinets can be in operation at the correct duties. Electric dampers are used to isolate any class 3 not in use. The Cat 4 containment line has several unique design features which are to the advantage of the operators. It is completely automatic in operation regardless of the number of class 3 cabinets in use. The spine is exhausted at 5 equi-spaced locations to ensure air movement is largely lateral and not axial along the spine. This limits cross-contamination in the event of a leak to the spine. A rail is located along the length of the spine floor which carries a platen for transporting sample containers along the line. A dunk tank located at the entry point to the spine is equipped with a winding mechanism to automatically pass the sample containers beneath the weir plate into the spine. An autoclave is permanently connected to the exit end of the spine to allow for decontamination of used sample material.